This topic contains 66 replies, has 17 voices, and was last updated by Anonymous 12 years ago. Whats up with that line? Obviously it works on your machine, the point is it doesnt work on anyone elses. Hey, thats a good line!! Its because artists dont know how to follow the instructions. Real men don’t read, they shoot! And programmers dont need to be bothered by artists who would rather complain and waste our time than RTFMing. Thus proving that artists are completely useless (without programmers…)? graphics sell games, so artists keep programmers in work. True, its a vicious cycle, I reckon we should all just try to get along and blame everything on the game designers instead. Or maybe its all the producers fault……….what do they actually do anyway? Don’t get me started…just don’t…not today. I’ll get myself fired. Well worth checking out if you have a few minutes to spare. …you give the artists any kind of creative control. You can get yourself fired now Damian. …when Jesus appears in your texture maps. Isn’t that refering to Half Life…. I think you’re talking about designers, not artists and certainly not about producers. Artists, and producers for that matter, who think they are designers are just problems. There seems to be a lot of anger here…. Must be the people he works with. 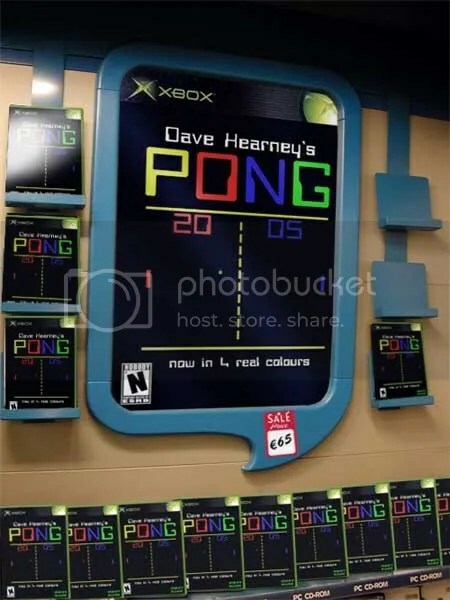 So by your “logic” kearney the game store would have nothing else but Pong on the shelf – oh in a range of colours of course – as long as it’s less than 4! At this rate, you are heading towards producer status! By my logic, as I tried to explain above in such a fashion that even an artist such as yourself could understand, if I program PONG, it will SAY pong on the box, NOT half life 3. Awesome! Whats your suggestion on gameplay? 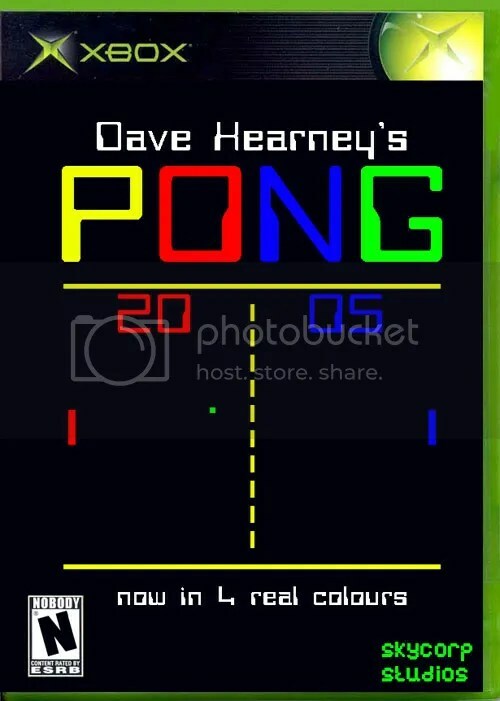 DAVE KEARNEY’s PONG 2006 Pastel edition. The only people that should be taken to a public place, naked, coated in tar and feathers, doused with gasoline then set alight and possibly allowed to run towards the nearest water cleaning plant are the suits that have turned the hobby into an industry, or dare I say it, a business. The only advantage of trying to be an artist and programmer is that you can get flamed by both sides who both hate you with equal disdain. LOL. I don’t know, I never get flamed. I make it a point not to try to bother the “other side”, rather I try to get them to the other side so that there are a little less flames in this harsh world. I am friends with a very good psychologist, I could pass on your number if you want…..
More on page two of this thread too ;) Your not getting out of it that easy kearney!!! Dragging up old dirt again are we! Yeah it’s so old…yer game is kicking off a right pong!!!! So you want to be a programmer, and not an artist? Sorry, but if anyone mentons these so called “Artist-Programmers” again I’m going to have to kill them. I dont buy it either. Technical Artists are ok…but you pick your side sonny! Artists – back to pretty pictures, programmers – don’t you have some documentation to write up? like ALL of it? No? Course you don’t, you document as you code don’t you? Skyclad : I _am_ a programmer. I just find it terribly tedious, once in a while. Then I start doing fun stuff like openGL and I remember why I liked it in the first place. What types of jobs can you get from studing programming? Artists are not a waste of your time. Your fancy pixel shaders and uber-cool graphics engine will look like complete and utter s**te unless you have talented artists producing the goods that can back it up. So give them the tools that they need, make things as easy as possible for them to express themselves and get the job done. Stop begruding them just because they might not have the same level of technical expertise or knowledge of computers as you do, everyone cannot be good at everything. Programmers are not all nerds, serial killers or star trek geeks. They do not smell and they are for the most part are actually quite approachable. Talk to them and you will see that. Let them know what you need and I’m sure they will listen. You are not cooler than them, you do not have a better taste in things or better social skills. Without them you’re stuff is going nowhere so learn to appreciate that. Ok you have a point. Maybe "Programmers are not all nerds, serial killers or star trek geeks. They do not smell and they are for the most part are actually quite approachable." maybe its just the ones I know ;) And there are worse things then star trek geeks…Babylon 5 geeks! Artists are a waste of everyone’s time! I would just like to point out that designers have gotten off very easy in this. Why do you think that is? Hey, I dont have a trunk or big floppy ears! The forum ‘Programming’ is closed to new topics and replies.